CHICAGO (BRAIN) — SRAM is recalling nearly 57,000 Zipp front hubs sold in the U.S. and Canada because a flange can fail. Separately, the company is recalling about 6,400 quick release levers because they can fail to engage in the closed position. This recall includes Zipp front hubs, models 88v6, 88v7 and 88v8. The Z logo is printed on the hub. The wheel hubs come in black, silver and falcon grey. The diameter of the clinch nut is approximately 1.46 inches. Some of the hubs were sold as part of wheel sets installed on new bicycles. SRAM will post a list of affected bicycle brands and models on its website at www.sram.com. SRAM has received one report in the U.S. of hub flange failure that could have led to wheel collapse. No injuries have been reported in the U.S. In the U.S., 54,000 hubs were sold; in Canada, about 2,900 were sold. Consumers are being told to immediately stop using bicycles equipped with the recalled front hubs and contact SRAM or local bicycle dealer for a free replacement hub. Consumers can contact SRAM regarding the recall at (800) 346-2928 between 9 a.m. and 8 p.m. ET Monday through Thursday and 9 a.m. to 6 p.m. ET on Friday, or visit www.sram.com or www.zipp.com and click on “Recall Notice” for more information. The hubs were sold from May 2010 through January 2015. The front hubs sold for about $215. Complete front wheels with the hubs sold for between $1,035 and $1,325. The front wheel was also sold as a wheel set with a rear wheel for between $2,300 and $2,950. The hubs were made by Prodigy Group, of Mooresville, Indiana and Decoletaje Y Fujacion, of Spain. SRAM is recalling the Zipp Qrs over concerns they can fail to engage in the closed position, posing crash and injury hazards to the rider. SRAM has received three reports of the quick release failing. No injuries have been reported. The recall involves SRAM’s Zipp stainless steel or titanium quick releases. They were sold as aftermarket components or as part of the 202 DB V2, 303 DB V2, 404 Firestrike V2, 202 Firecrest V3, 303 Firecrest V3, 404 Firecrest V3, 808 Firecrest V3 or 808 NSW wheels. The quick release has a curved, black lever. The “Zipp” logo appears on the lever. 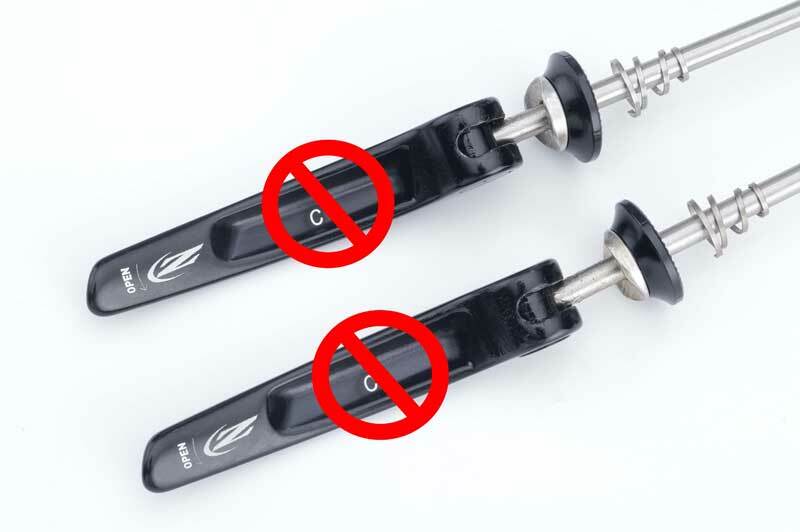 Only quick releases without a marking at the center of the underside of the lever, below the Zipp logo, are included on this recall. Consumers are being told to immediately stop using any bicycles equipped with the recalled quick releases and contact SRAM or their local bicycle dealer for a free replacement quick release. Consumers can contact SRAM at (800) 346-2928 from 9 a.m. to 8 p.m. ET Monday through Thursday and from 9 a.m. to 6 p.m. ET on Fridays, or visit www.sram.com or www.zipp.com and click on Recall Notice for more information. The levers were sold from March 2015 through December 2015 for about $47 for the stainless steel quick release and about $84 for the titanium quick release. Wheel sets equipped with the quick releases were sold for between $1,000 and $3,600. The levers were made by Ful Chee Ent Co., Ltd., of Taichung City, Taiwan. More information: CPSC notice | Zipp consumer notice (pdf). Only levers without the marking are being recalled.